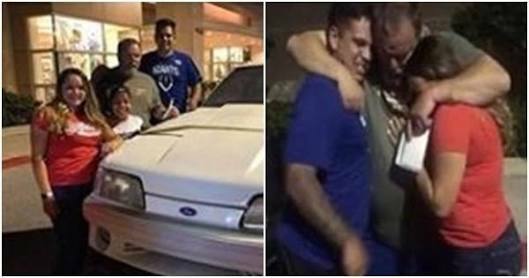 When his wife, Laura, was diagnosed with ovarian cancer 17 years ago, Wesley Ryan sold his cherished white 1993 Ford Mustang GT to help pay for her medical bills. The touching moment was captured and posted to Jake’s Facebook page. Jake told the San Antonio Express-News that he came across the car while perusing Craigslist a couple of years ago, but couldn’t close a deal. When it popped up again recently, he, his sister, Jeni and her boyfriend all chipped in to buy it. In a sad twist of fate, the seller was letting it go because her own mother had contracted ovarian cancer and they needed the money for treatment. Mr. Wesley told the Express-News that what his children did for him "shows where they are: they are balanced human beings.